Smart mobile device are ubiquitous accessories and many businesses now extend access to corporate content to personal phone and tablets devices. Since users now routinely turn to such devices for content discovery outside the workplace they provide a valuable opportunity to engage with clients directly. Within the research market, a growing numbers of firms have exploited the benefits of direct client distribution with over a hundred Research specific apps now available for both Apple and Android devices. To continue leveraging these channels effectively, a range of different devices and display formats need to be taken into account so to maintain the services many lead leading bank and independent research firms have chosen to outsource the build and maintenance of their apps to a managed service provider such as worldflow. 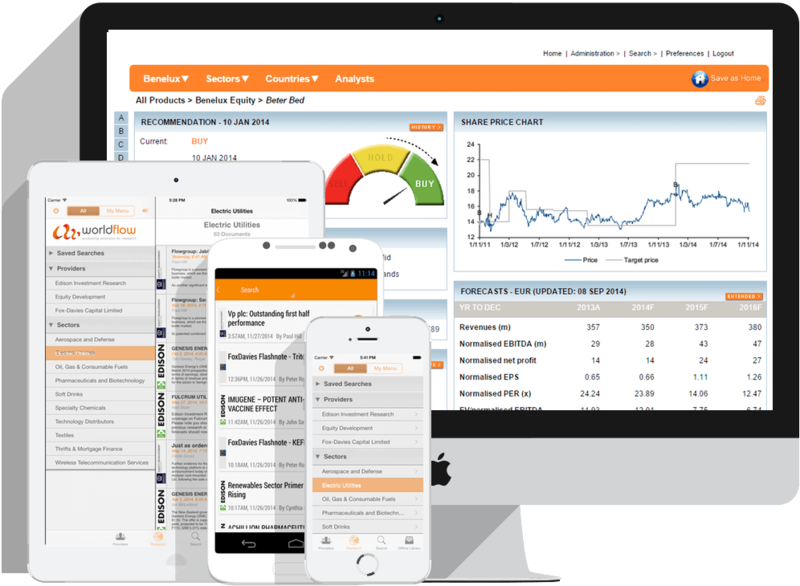 Provide customers with real time “always on” access to daily updates, the latest research, news and data through dedicated mobile applications for tablet and smart phone devices. Maintain control of your research with secure access mobile applications. Add value to client conferences by delivering pre-event materials, real-time delegate updates and follow up information directly to their mobiles. Click on the icons below to find out more about our client apps and download them from the iTunes and Google Play app stores.